I came across this little beauty on Ebay the other day and decided to buy it. I have never had a film scanner and at £12 this seemed to be a steal. Marketed as the Agfa Digital Converter, this item is aimed at those with a drawer full of slides and negatives in need of conversion. 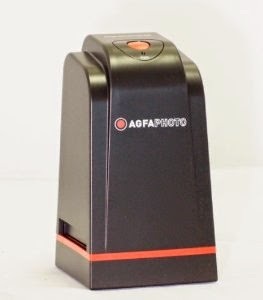 The first thing you need to know about this item is that it is not manufactured by Agfa - its a generic made-in-China film scanner sold in the early to mid noughties and marketed under a variety of names - Agfa, Ion, SVP, Innovative Technology, EU3C, Otek and Plexgear to name a few. It is also known by the various brand names as the FilmScan 35i or by the boring model number SCND502E1231. The one thing these companies have in common is a complete disinterest in providing legacy support for their scanner. If you have lost the disc it came with and are running something more up-to-date than Windows XP Service Pack 2, you are pretty much screwed. I trawled the internet for a fortnight finding a driver for this thing. Windows 7 did its best to find a driver (which was useless) and others failed. I was about to give up when I chanced upon a driver for this which actually works in Windows 7. If by some way you are reading this because you are looking to get this thing working on Windows 7 then I am about to make your dreams come true. 1. Firstly, get rid of any previous attempts to load a driver and make sure the scanner is unplugged. 6. Right click on the icon, choose properties, choose compatibility, and then choose 'run this program in compatibility mode for Windows Service Pack 2' Make sure the box is checked. Save. Connect your scanner and click on the icon. You should now (pray) have a working FilmScan35i on Windows 7. You will know its working because there will be light in the negative carrier slot. With that, I had a working scanner. I had to wait until daybreak to venture into the spider-kingdom which is my garage to find some slides. Following the fairly simple user-interface I managed to capture this slide in glorious digi-vision for eternity. 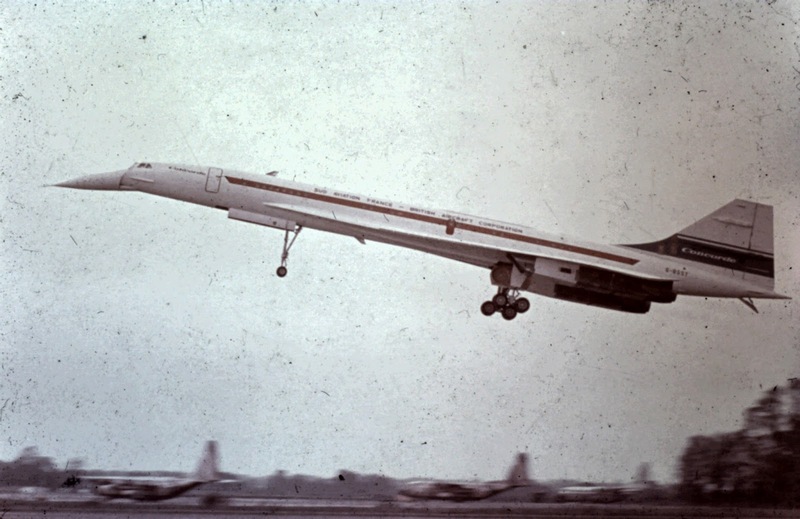 This, if you are not aware, is the prototype Concorde taking a test flight. OK, maybe I should have invested in a can of compressed air. The scanner does come with a velveteen brush which is good for getting hairs out of the scanner but hey - nothing moves dust like a blast of air from a can. The good thing about this scanner is the speed in which you can get stuff done. Once you are in the rhythm you can digitise quite quickly. Not bad for £12 on Ebay! The bad points - there is absolutely no adjustment. You can do 1800 or 3600dpi, and thats it. The scanner automatically adjusts the exposure - in some cases quite badly, obliterating skies and skin tones in the process. You can 'cheat' the scanner by pressing 'scan' as it is adjusting. But its not ideal. The whites can be a bit pixellated and blown out. If you need control you really need to fork out for something golden like a Nikon Coolscan. Am I expecting too much from a £10 scanner? Budget alternatives include the Lomography scanner for smartphones which uses the same technology, this may or may not have adjustment but will certainly have full frame capture if I know anything about these hipster moneygrabbers. Alternatively you can get an LCD monitor to display white light, tape your slides or negs onto it and snap away with a digital camera. Finally a backlit flatbed scanner will certainly scan slides and negatives and many come with slide and negative carriers. Final verdict - bargain. But if you want perfection you will need to pay more. Much more. No matter, I'm off to find some more negatives to scan. Now where did I put that spider-repellent? Hi, Have one of these (not branded Agfa but looks identical and explains the 'Agfa look'). It came with the 7/Vista driver you found which is working fine with Windows 8.1. Hi, Many thanks for this post, I have just been given one of the Agfa slide scanners and following your instructions is working perfectly on Windows 10, I can get started on my slides from the 70's Wife is a widow yet again now I have a new toy to play with. My old Plextor scanner works again! I've lost my CD but at least I can scan my old negtives again! Great! Thanks it worked on windows 10 for me .And by the way the person who said it has a virus ..I ran a virus check on it and it does not show that at all . I really appreciate it . Thanks so much for helping me to get this scanner to work finally! Had to install the program a couple of times to get it to run under Windows 7 Home (probably operator error) but now it's fine...images are not super crisp but what can you expect for $35NZ for the scanner! It's still a great bargin now that it is up and running. Can't afford the Nikon one! Need the driver for Mac OS X El Capitain. Anyone have any direction on finding that dmg? I've had an Innovative Technology FilmScan35I for some time. Truthfully I don't even remember where it came from. It says Kohl's store on the box but I'm thinking a thrift store maybe. No disc. I'm running Windows 10. The download went fine and the program works great. WooHoo! am running Windows 7Pro... found one of these "Innovative Technology FilmScan35I units on the electronics shelf for $2.92... found this post of yours... and EVERYTHING WORKS PERFECTLY! The unit was missing the slide "slider" and merely placing the slide in the slot, manuevering it with a wooden ruler, centered in on the light pad, but the image was a tad out of focus. I attributed this to the millimeter or so the "slider" would have spaced the slide closer to the lens. I was able to make a 2.5" x 6" "slider out of cardstock, and the result is AMAZING! Many thanks for your detailed instructions. I too have a spider kingdom in the basement with slide trays posing as stacked condos for our 8 legged friends, and I must now find MY repellent as well! Worth looking at this site for all relevant information and support documents and downloads. Hi - thanks a lot; unfortunately I am always getting the message "Can not find camera" - any idea what to do? Thanks for the advice! Now I am as close as I have never been before to make this scanner to work. BUT, the lower part of the Live View window has a strange disturbance about 2 cm high. I do not manage to get rid of it no matter of what I am do. Any advice how to get rid of this? Thanks so much. I have just downloaded the driver and cross fingers, hope it works.